We've called it VILLA PANORAMICA for a reason!! Located on the top floor of a small new house, built in the grounds of an 18th century villa, it is completely self contained and although only minutes walk to the village, is very secluded. Everything here is new, but fits in perfectly with the style of the houses built along the lake and in the mountains over the last centuries,with wood beam ceilings, ceramic floors throughout and Italian tiles in the kitchen, and bathrooms. (High chair and crib for small children are available. 6 people can sleep here comfortably and lucky who sleeps in the sofa bed, you will wake up to stunning views of the sunrise over the mountains across the lake. The 2 bedrooms and bathrooms are seperated from the living area by a sliding glass door. There is a TV in each bedroom. The bedrooms are large and comfortable, with spacious mirrored closets, one has an en-suite bathroom and the other has the other bathroom, with jacuzzi tub, right outside the door.There is satelite TV, DVD, surround music system and a variety of CDs and DVDs for you to enjoy, while relaxing and taking in the views. Ideal for all types of holiday, winter and summer and for short weekend breaks and business trips. Of course, there are many vacation rental apartments all around Lake Como, this is NOT a vacaation rental, it is our apartment, created and furnished to be used year round and we take advantage of it ourselves, when we can. Although we live only 10 minutes drive away in the hills, we find it so relaxing here, just sitting on the terrace watching local life carry on in the village and on the lake. Argegno is in an excellent stratigic position. It is easy to reach all the other towns on the lake by ferry, bus and car, you couldn't aske for a more convenient point. 'Villa Panoramica' is only a 15 minute drive away from Cernobbio, the world famous hotel Villa D'este and the famous Villa Erba, where many exhibitions and trade fairs are held, the City of Como is a 20 minute drive away and of course Como is the silk capital of Italy, so there are many silk and textile factory outlets and shops in the town of Como.Milan is 50 kms, 1 hours drive, so it is also ideal for combining a holiday with the world famous 'Monza Grand Prix', or any other sporting or business events which you may wish to attend in Milan. All travel information will be provided to guests enquiring about the apartment, as will a welcome book (provided in the apartment) with the local tours and suggested walking itineries in the area, local information and suggested boat trips. It is also five minutes drive away from the 'Villa Oleandra' the villa acquired from the Heinz family by George Clooney, and George has been spotted in Argegno often mixing with the local people. The Villa Fontanella, once inhabited by Gianni Versacci is 10 minutes drive away. Villa Panoramica is also ideal for those who do not want to be troubled with driving in Italy. The local bus stops directly below the villa and so does the local boat. There is also a public bus service from Milan Malpensa airport and Como is also well served by the international train service. We can also offer an excellent English speaking taxi driver service, which is available on request. Switzerland is also a short drive away, 45 minutes by car,in fact, Argegno sits at the foot of the 'valle Intelvi' a beautiful open valley which links Lake Como to Lake Lugano in Switzerland where you can find the City of Lugano, Campione D'italia, with it's famous 'Casino' and lovely lake front walk.The famous 'Jet set resort of St. Moritz is a two hour drive away. TAKE A LOOK AT THE RENTORS CALENDER BUT IF THE DATES YOU REQUIRE ARE NOT AVAILABLE, PLEASE CONTACT ME AS I HAVE OTHER APARTMENTS AVAILABLE IN THE SAME AREA. I have lived on lake Como since 1983 after being born and brought up in London UK. My husband is from here and has transmitted to me his love of this beautifull place. Before moving to Italy, I worked for British Airways at Heathrow and have always worked looking after holiday makers on the lake, so I feel comfortable giving reccomendations about things to do, where to eat and almost anything you might need to know, I am happy to share as much with my guests as possible to make their stay as enjoyable as possible. We live 10 minutes drive from the apartment, which we bought because we fell in love with the views from the terrace, everytime we come to the apartment to make sure all is OK, we breathe a sigh........ it's so beautifull, you could never be tired of seeing what we see from there. We think we have offered our guests a good service in the past, lots of information and help organising boat rental and special trips. I am also a guide for the villa Balbianello, a property belonging to the Italian National trust and love taking my guests to see it, it's something that shouldn't be missed. The pure magic, the 125 sq, meter terrace with un obstructed lake views, the comodity of not needing to have a car, the town of Argegno is so convenient for everything. Apart from the views, the convenience of being 5 minutes walk from one of the busiest little towns on the lake, where all the ferries stop, there are lots of restaurants and cafes, in the apartment we have air-con, heating, satelite TV,a full kitchen and WIFI, included in the rental price. There are no obstacles blocking the view of the lake, just pure BREATHTAKING lake views. Enjoy the views south towards the narrowest part of the lake and north to the Villa Balbianello and Bellagio, below you is the lovely buzzing little town of Argegno. The apartment sits at the foot of the Intelvi valley, so as well as lake views, you can enjoy views of the hillside and the cable car which runs to Pigra, the town at the top of the mountain. Obstruction free views of a good portion of the lake, Argegno, relax and watch the ferries go past. We stayed here for close to two weeks over Christmas and New Years and it was a little slice of paradise. The apartment is even nicer than the pictures suggest with a view that is unforgettable. The apartment is very well appointed and Silvana was brilliant to work with before and during our stay. There is a walk uphill from the town but it took only 10 minutes up and 5 or less on the way down. Argegno is a charming village - big enough for regular bus and ferry service but not touristy. We enjoyed a great meal at La P'Osteria and several cafes in town but did eat at home often - and used the BBQ which was a treat for my husband - as we had a young child who was not always up for late night meals. We can't recommend this spot highly enough and hope to come back again - soon! 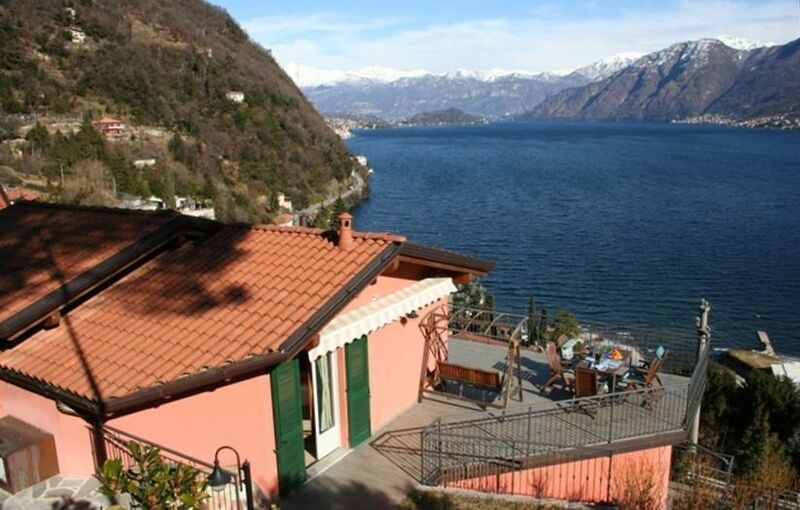 Splendid location with magnificent views over Lake Como on three sides of the apartment. Plenty of room for two couples, though one bathroom has bathtub with hand-held shower head and no curtain. Well-equipped kitchen has large frig an easy-to-use dishwasher. Very comfortable terrace with couch and chairs. Wi-fi weak and intermittent. Parking place adequate for only a very small car, so on-street parking is the better choice. Argegno is a lovely and pleasant village central to interesting sights on the west side of Lake Como. Silvana is very friendly and welcoming. Villa Panorama is a perfect place to enjoy the beauty of Lake Como. The pictures understate the spectacular views from the veranda that runs across the length of the apartment. It was perfect for two couples with nice sized bedrooms, two very nice baths, a spacious living/dining area, a great kitchen that was fully equipped for any type of meal preparation, and a washing machine. We had full access to wireless internet which worked well. There is room for a small car that was protected by a gate. There is a steep walking path down to the town, but we are in our 60’s and had no problem with it. Silvana was very helpful and had a fully prepared list of restaurants and local sights. For us, Villa Panorama was a perfect place to stay on Lake Como and we will definitely return. There are enough words to describe Villa Panoramica. It was one of the best places my wife and I have ever stayed in. The apartment was very comfortable, clean and was everything if not more than the description in the VRBO listing. The view from the terrace was very stunning. Sylvania and her husband were wonderful hosts. I would highly recommend to anyone who plans on visiting Lake Como. My husband and I stayed hear for 4 nights in late September 2011. It wa all and more tha we expected. The house is beautiful and the views are priceless and stamped in my memory. The resturants in town are great...rissotto with chestnuts, spaghetti ilario and Silvios in Bellaggio- fantastic. We spent 5 nights here this past July (2011) and it is everything we thought it would be. The house is wonderful, the views are unbelievable and the relaxation we had was well-needed. I can't wait to go back. Silvana is a great host and she really helped us, especially with a very rainy check in day. But the weather cleared up for the rest of the trip. If you go, we highly recommend the lunch cruise around the lake. It leaves around 1 pm and you take it from Argegno. It was a feast for only 15.50 euros. In summary, we all LOVED Villa Panoramica! All travel information will be provided to guests enquiring about the apartment, as well as a welcome book (provided in the apartment) with the local tours and suggested walking itineraries in the area, local information and suggested boat trips. While spending a holiday on Lake Como, you will have the chance to see much more than you would expect. You could use this as a base to visit Venice, Verona and many other beautiful and interesting cities in the north of Italy and Switzerland, we are only 25 minutes drive from the border. The rates shown are for 2 guests. 3 guests or more pay€300.00/week extra, or €10.00 per person per day There are no other charges on top of the rental fee, WIFI, final cleaning and utilities are included.